These candles are produced for day to day use. 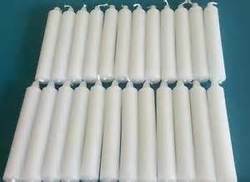 There are various varities of these candles, available in packets containing 6 candles and 32 candles. These candles are produced from pure white paraffin wax giving bright light for hours. Home utility candles. 10 pc pack. Unscented candles for home use.